We just got back after 6 weeks in the Berry Islands. What a jewel! Two years ago we made a brief stop, liked what we saw and this year we had an old friend there so it didn't take a lot of coaxing. The first thing we noticed was, like the rest of the Bahamas, the amazing water clarity. The second was the number and variety of fish. This is one of the few areas that you can actually still feed yourselves with a hook and line or Hawaiian sling. We pretty much had the anchorages to ourselves or occasionally 2 or 3 other boats but everyone was spread out and you never felt crowded. We did have pay attention to the weather and we picked the anchorages accordingly. Our favorite was Hawks Nest Cay which was great for everything but N-E. When those winds came up or were predicted, we moved to Panton Cove by Big Stirrup, 7 miles away. 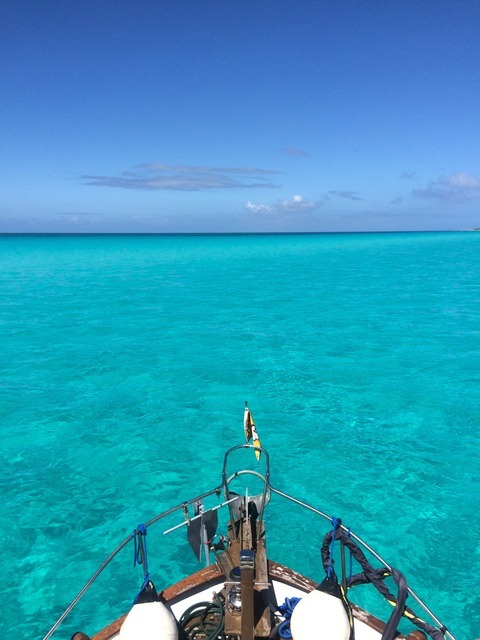 When the easterlies were blowing, Bonds Cay was very good with great reefs for snorkeling at the north and south ends. We ended up at 8 different anchorages, some multiple times, and spent 3 nights in a marina visiting friends/waiting on weather. We had internet the entire time. Provisioning was typical Bahamas, Bullocks Harbor had fresh stuff weekly of a mixed quality. We did not go to Chub Cay which is the other option for provisioning in the Berry's. Go again? You bet!. We were there for 10 weeks this winter. It was the best destination we'd been to in the 12+ years we've had our trawler. How we missed this to travel further for similar (or worse) beaches is bewildering. We're going back for a month next winter. I'm hooked. I was surprised how few boaters were there. It's convenient to get to: just a 2-day trip from FL, 50 miles from Miami to Bimini/Gun Cay then 75-80 miles to Great Harbor across the Great Bahama Bank. Larry, what kind of chain grabber do you have on your bridle? I need to get one. OK, great pictures and post. Could you please now delete it so the place will stay quiet for all the rest of us who like to go there too. We were actually on our way to Cuba but ended up in the Bahamas. We made a plus/minus list. The Bahamas won and Hobo just turned to the left. Next season maybe both. Wow Larry looks like fun . Thanks for posting pictures . With all the talk here lately of Varnish , Cetol ,sanding and just plain boat work talk I had lost sight of what this whole thing was all about . Now I'm motivated . William has been to the Bahamas a few times but without us . Livin the dream. Its pics like those that make me feel Im on the wrong coast. Very nice. This is a small section of a map I have framed in my office . I have been caught by my boss standing and staring at it more than few times . He just grumbles something that sounds like what the f#%k and stomps out of the office . We just had a short trip there, but we stop by every chance we get. So many people I know go to all the rest of the Bahamas but overlook the Berry Islands. We went right after memorial day. They're never crowded. We love to just take the Rib down and explore islands. It was great meeting the two of you at Great Harbour Cay, The Berrys really are difficult to beat. Man am I dying to go there. I'm hoping to get the admiral to consider a flight/ stay. Maybe this could lead to bringing the ship over. Not much in the way of hotels I think I read? Mostly cottages for rent? Like wise! if you pass by Jax this fall, give us heads up. We'll get together. Get a hold the marina manager in Great Harbor. He's a great resource and keyed into what's available. Also flights were only $60 each way from Nassau, twice per day so GH is pretty accessible. On a cruise through the Berrys years ago, I anchored between Frozen and Alder Cays. The only other boat in sight, also anchored, was a big, gleaming sport fisherman with the hailing port of Jacksonville, FL. Me: "Beautiful yacht you're traveling in - did you all just cross from Jacksonville?" Distinguished-looking gentleman: "Well, no - we just ran up from Nassau today." Me: "Oh - well, your hailing port is familiar to me. Are you basing your boat out of Nassau then?" Gentleman: "No, we live there now, at least for the foreseeable future" (glancing at his companions with a smile). Me: "I see. Well, that sounds nice" (suspecting that I had stumbled across a nefarious fugitive financier, or worse). Then, endlessly curious: "Are you able to do business in the Bahamas without difficulty?" Gentleman (now grinning broadly, and offering his hand): "Yes I am. In fact, I am your American ambassador to the Bahamas, and these are our dear friends from back home in Jacksonville . . ." (introductions followed all around). Now there's a job to have!